Here at Score Basketball we focus on both the mental and physical aspects of the game. We had been training players for the last 20 years and since that time we had been featured on ABC, NBC, CBS and several different local media outlets. 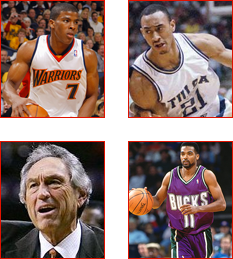 Our method has been endorsed by legendary Hall of Fame basketball coach of Oklahoma State, Coach Eddie Sutton as well as NBA superstars and basketball player Shea Seals of the LA Lakers. Gi get ve ready to improve your self as a player by giving us a call at 918 – 955 – 7160. Here at Score Basketball we always train a player player by working on both their strengths and weaknesses. The ultimate goal is to build well-rounded players who are surely going to stand out to recruiters and colleges throughout the states. We were founded by Coach Don Calvert who is passionate about helping young basketball players become all that they can be. Everything that he teaches can be applied to life. A basketball player who has character and integrity will go far no matter what they decide you after they get off the court. When you are at one of our Oklahoma City basketball camps be prepared to work. Most of the time parents are afraid that their kid is just going to stand around and do nothing. That is not the case here at Score Basketball. We focus on improving your player and not wasting their time or your money that you paid for the basketball camp. We want to make sure these players understand that they are here to work and if they are dedicated they will see improvement in their overall skill set. We guarantee you will improve if you decide to attend one of our Oklahoma City basketball camps. It doesn’t matter what skill level you’re at, there’s something here for everyone Score Basketball. We focus on developing a player and meeting them exactly where they are at when it comes to their skill set. We want to train them out right and trained them so they can handle both the physical and mental aspects of a basketball game. This is what recruiters are looking for. They’re looking for players who can handle the stress of the game while still using masterful skill. So it you’re ready to improve yourself as a basketball player, we invite you one of our Oklahoma City basketball camps or one of our clinics. We you will be going over dribbling, speed, agility, footwork and so much more. Even professional basketball players practice and continue to practice so they can be better. That is what we do here in our facility. We provide you with NBA style goals and basketballs for every child who attends one of our basketball camps. Development a great player and learn from the best. If you’re looking for more information about how you can begin to become a better player please visit us online or simply give us a call at 918 – 955 – 7160. Score Basketball was founded by Coach Calvert who trained Shea Seals of the LA Lakers and is the private lesson coach of choice for Tulsa Shock Member Glory Johnson. Over the last 20 years he has trained and helped countless players improve greatly on their skill, their tenacity and their drive to become better. He is a championship winning basketball coach and his methods have been endorsed by Coach Eddie Sutton, Hall Of Fame Basketball Coach for Oklahoma State. His method has also been endorsed by NBA scouts and several other NBA players. Check out Score Basketball for more information about our Oklahoma City basketball camps. That is what we say here at Score Basketball because we strongly believe that the time is now if you want to get better. Not tomorrow, not the next day but right now. It’s time for you to take your basketball career into your own hands, listen and be trained by one of the top coaching facilities in the state of Oklahoma. Several players have gone on to hundreds of universities on scholarships which include OSU, Indiana State, Arizona, Missouri State, and the list goes on. Here at Score Basketball we believe that by producing a better person we can ultimately produce a better player. Here at our Oklahoma City basketball camps every player will learn how to reach their full potential and ultimately put them on the road to becoming a pro. You’ll be trained on your speed, agility, footwork, dribbling and shooting. We take great pride in training up players to be the best they can be by equipping them both mentally and physically for the game of basketball. Here you will learn how to take your weaknesses and turn them into strengths. You will also learn how to take your strengths and make them even stronger. Our method has been endorsed for the very reason of producing great players and producing great people. Our lessons are directly tied in with life and Coach Calvert as a way of showing you how basketball is related off the court. If you can live a life of character, integrity and forever training and teaching yourself, you can ultimately do whatever it is you want. Most players do not go on to play in the NBA because they would rather star a business or become an entrepreneur. The lessons that they learn produce the character and the mental capacity to handle the stress that comes with doing that.. If your looking for your player to improve greatly in their skill than there is no better place than one of the top training facility in the state of Oklahoma and is ran by Coach Calvert who was personally instructed by Coach Bliss and by Coach IBA. He has over two decades of experience teaching players to take their game to the next level on the court and off the court. This is your opportunity to become something greater than yourself and play like a professional basketball player. Check out our basketball camps, private lessons and our clinics on our website today.